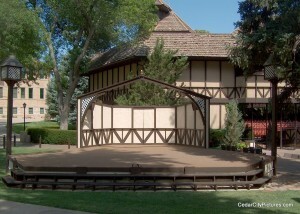 The Adams Memorial Theatre, dedicated in 1977, was designed by Douglas N. Cook, festival producing artistic director, along with Max Anderson of the Utah State Building Board, and is patterned after drawings and research of sixteenth century Tudor stages. Experts say it is one of a few theatres that probably comes close to the design of the Globe Theatre in which Shakespeare’s plays were originally produced. It is so authentic, in fact, that the British Broadcasting Company filmed part of its Shakespeare series there. It is named for Grace Adams Tanner, a major benefactor of the Utah Shakespeare Festival, and her parents, Thomas D. and Luella R. Adams. It seats 819, plus 66 gallery-bench or standing-room seats.